Tash Sultana, Disney On Ice, Kojo Funds, Parkway Drive and much more! One-woman band Tash Sultana is the multi-instrumentalist clocking up some serious amount of streams on YouTube. Her internet fame has seen her debut album 'Flow State' become a commercial as well as critical success. Having already sold out all her dates this September, Tash Sultana now announces a major London gig taking place at Alexandra Palace on Friday 28th of June. 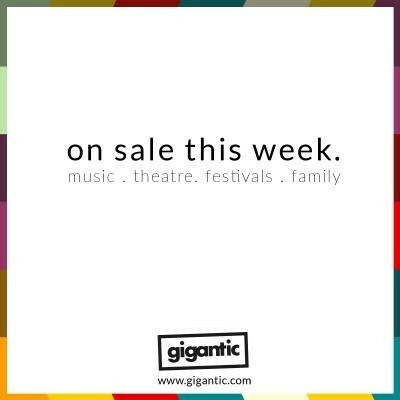 Tickets are released later this week, so set your personal reminder with Gigantic right now! Tash Sultana tickets are released at 09:00 on Friday. Prepare to embark on a magical adventure with Disney On Ice Dream Big. See the story of fearless Moana and Maui as they embark on an action-packed adventure in search of the stolen heart of Te Fiti. Plus, appearances from Micky, Minnie and all your favourite Disney characters. Disney On Ice tickets are currently available. Formed whilst students at the Liverpool Institute Of Performing Arts in 2003, The Wombats have grown to become one of the cities best known bands. Having achieved massive commercial success with the album ‘Beautiful People Will Ruin Your Life’, the y now announce unmissable outdoor gigs. The Wombats tickets are currently available. Nicki Minaj is internationally renowned, having sold over five million albums including her brand-new tile ‘Queen’ which broke the Top 5. She is joined by fellow superstar Future for huge arena shows in London, Birmingham and Manchester. Nicki Minaj tickets are currently available. Platinum selling rapper from East London Kojo Funds first made waves with the release of his huge tune ‘Dun Talking’ which saw him rise from the underground and become one of the UK’s hottest new talents. Catch him on tour in October. Kojo Funds tickets are released at 09:00 on Friday. Madrid’s finest indie rock band Hinds burst onto the scene with their debut album ‘Leave Me Alone’ in 2016. Now they’re back, following it up with new LP ‘I Don’t Run’ which they take out on the road on a Autumn/Winter tour. Hinds tickets are currently available. With so many people all wanting to get their hands of these tickets, it can be easy to miss out. Make sure you set a personal reminder with Gigantic which will alert you with a text message or an email just before they are released. Ritual Union unites the many excellent venues of Oxford on Saturday for a wonderfully eclectic day of music. Acts include Gaz Coombes, Ghostpoet, Nadine Shah and many more! Ritual Union tickets are currently available. EFG London Jazz Festival is an annual celebration of the many wonderful facets of the genre showcasing some of the world’s very best talent in gigs across the capital. EFG London Jazz Festival tickets are currently available. Everyone is up for The Downs. A massive all-day festival featuring true icons of rock and dance, including Noel Gallagher’s High Flying Birds, Paul Weller, Orbital and more. The Downs tickets are currently available. Metalcore fans will be thrilled to know awesome Australian band Parkway Drive will be blasting off 2019 with a handful of UK dates in support of their new Top 20 album ‘Reverence’. They will be joined by Killswitch Engage and Thy Art Is Murder to complete a mighty line up each night. Parkway Drive tickets are currently available. Mixing southern style rock with heavy grunge overtones, Black Stone Cherry burst out of Kentucky in 2001 to achieve worldwide fame. Having released their latest album ‘Family Tree’ in April, the finish the year with an extensive winter tour. Black Stone Cherry tickets are currently available.